The GPW-B weighing carriage plate is a very accurate weighing system, that can be combined with various attachments, such as rotators, clamps etc. The indicator can be fitted with a printer, that can print a ticket with the weight data on the spot, or can transfer the data on-line to a computer network, by radio frequency. 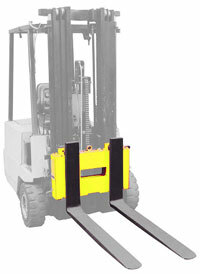 With the Bruss GPW-B you weigh rolls, barrels, crates and pallets during transport, on the place of handling. You save time in checking incoming and outgoing goods, in determining expedition weights and in filling big bags in production. 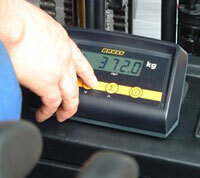 Power supply for the weighing system comes from the battery of the lift truck.